Language is a very important part of Indigenous history and culture. As a result, finding ways to increase the number of people speaking Indigenous languages is becoming a focus for Indigenous communities and Canada as a whole. Below are a number of helpful websites, videos, apps and tools that have been developed to assist in learning Indigenous languages. The Michif Language Project (http://www.michiflanguage.ca/index.html) developed by the Cowichan Valley Métis Association, is a fun web resource with animated videos that focus on learning numbers, colours, food, animals, body parts and names of relatives. There is also a video with syllabic exercises and a language guide. Métis Nation BC Learn Michif website (http://www.learnmichif.com) is an on-line resource with 4 separate lessons where you can learn greetings, how to speak about your family, the weather and how to order food. There are also videos where you can watch people speaking. Michif to Go (https://play.google.com/store/apps/details?id=com.emap.michif&hl=) from the Gabriel Dumont Institute, is an English-to-Michif Dictionary app available for Android phones. It has over 11,500 translations and audio pronunciations as well as a search tool to look up the English word to find the Michif-Cree translations. Michif Lessons (https://itunes.apple.com/ca/app/michif-lessons/id965897763?mt=8) from the Gabriel Dumont Institute, is a downloadable app that contains over 60 exercises to learn over 1000 Michif words. Online Cree Dictionary (http://www.creedictionary.com), developed in partnership by the Miyo Wahkohtowin Community Education Authority (MWCEA) and Dr. Earle Waugh Director Center for Culture & Health Family Medicine, University of Alberta (U of A), is a web based interactive First Nations language portal with dictionary and curriculum based resources to further the development for Cree language in Canada. 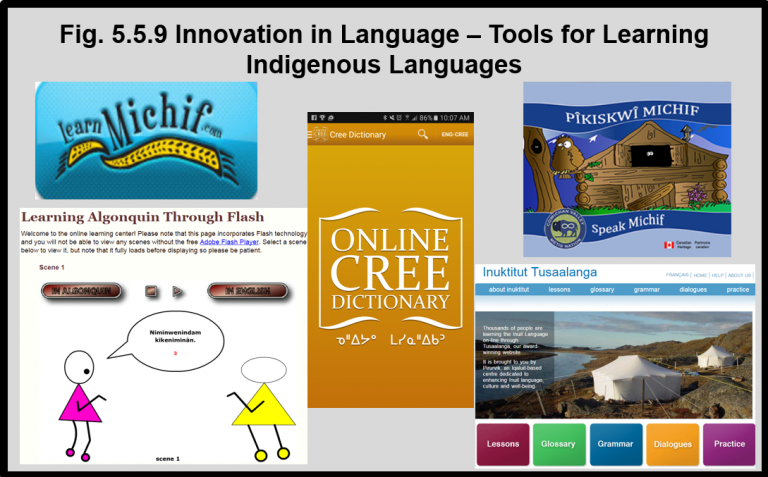 The website and downloadable app provides translation functions, the creation of flash cards and storyboards using pictures and words (syllabics and English), educational games such as word matching and puzzles, and a database of Cree language lesson plans to help teachers integrate Indigenous languages into the curriculum. Learn Algonquin through Flash (http://kzadmin.com/Learningalgonquin.aspx#), developed by the Kitigan Zibi Anishinabeg, is an on-line learning centre that has a series of 20 different scenes with stick figures speaking the language. You can listen to the conversation in English or Algonquin. Inuktitut Tusaalanga, (http://www.tusaalanga.ca) developed by the Pirurvik Centre, is a website dedicated to helping people learn Inuktitut in a variety of different dialects. Through a series of on-line lessons, learners can see spellings and add words or phrases to a playlist to hear how they should be pronounced. There is also information on grammar and exercises to practice what has been learned. 1Canadian Encyclopedia. Aboriginal People and Languages http://www.thecanadianencyclopedia.ca/en/article/aboriginal-people-languages accessed August 22, 2017. 2Statistics Canada, 2011 National Household Survey, Statistics Canada and AANDC tabulations. https://www.aadnc-aandc.gc.ca/eng/1377004468898/1377004550980 -accessed August 2, 2017. 3Statistics Canada, 2006 Census of the Population. http://www12.statcan.gc.ca/census-recensement/2006/rt-td/lng-eng.cfm – accessed August 2, 2017. 4Justin Trudeau, Prime Minister of Canada, Government of Canada website. http://pm.gc.ca/eng/news/2016/12/06/prime-minister-justin-trudeaus-speech-assembly-first-nations-special-chiefs-assembly – accessed March 7, 2017.